The Ultramarines are the epitome of a Space Marine Chapter. Warriors without peer, their name is a byword for discipline and honor, and their heroic deeds are legendary. 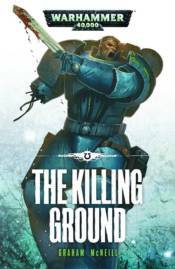 Returning to the Imperium after completing a deadly mission in the heart of the Eye of Terror, Ultramarines exiles Uriel Ventris and Pasanius find themselves on a war-torn world where warp-tainted rebels hold the balance of power. As the pair of Space Marines try to save the planet from the Ruinous Powers, they find that they themselves are suspected of being in league with the Dark Gods, and their chances of a triumphant return to their Chapter look bleak.